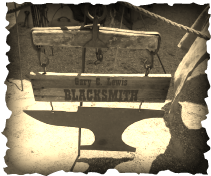 Hi, my name is Gary and I discovered blacksmithing in 2004. It has become my main hobby and has given me much enjoyment and a broader knowledge and appreciation of history and what our ancestors had to do to get by. 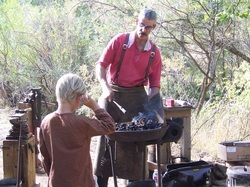 I have a small shop in my backyard, do mostly handwork, no power hammer, and enjoy doing public demonstrations. 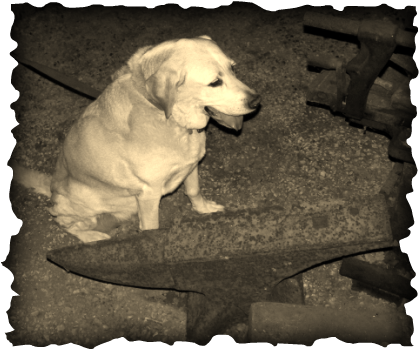 I have smithed for many local Pacific Northwest museums and events, historical and otherwise. I am a volunteer smith at Fort Vancouver National Historic Site and enjoy making functional objects from the Colonial Period to the Oregon Trail that people would have needed and used. This site is mainly for family and friends to keep track of my whereabouts and see what I've been up to. 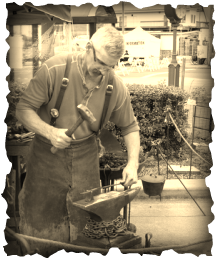 Feel free to contact me if you have an event you think I would fit in at, something you'd like forged, or just to say hello and ask a question about smithing. Slideshow by Bob Rock Photography. Taken in Mitchell, Or. Stagecoach trip 2009. Click on the picture at left to view the slideshow in a new window. Link below is to Bob Rock's website.